Here's a Book Lovers Collection bookmark favor you'll love to share, because it's shaped like a lovable teddy bear! 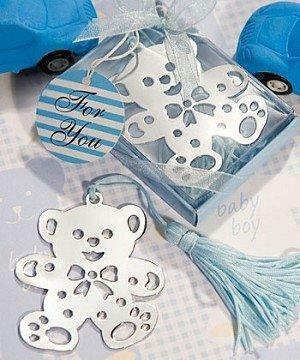 Celebrate the arrival of your new baby boy with one of childhood's most loved friends – the teddy bear. And, your family and friends are sure to get a smile from this little character each time they open up a book and see him inside. Each Book Lovers Collection bookmark, measures 5 ½" with tassel and has a silver metal teddy bear charm, enhanced with detail-proving cutouts for the face, paws and a bow.